With summer fast approaching, it’s time to break out the swimsuits and sunglasses. For many, the arrival of summer also means dusting off their Harley Davidson and taking it out for a spin. If you’re a motorcycle enthusiast, you’ll probably have a bike no matter where you live. But we figured some American cities are better than others when it comes to speeding down the highway. So for the second year in a row, SmartAsset set out to find the best cities for motorcycle owners. In order to find the best cities for motorcycle owners, we took into account a number of factors. We looked at discretionary income and the number of property crimes for each city. We also took into account weather conditions, traffic and states’ maximum highway speeds to find the best places for you to get on your bike and ride. This is the 2017 edition of this study. Check out our 2016 analysis. Fort Collins riding the high road. 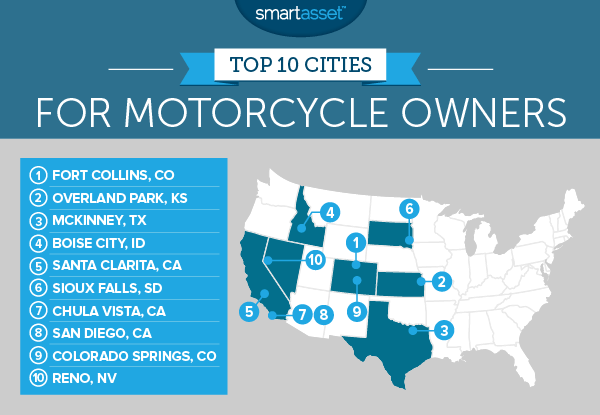 Just like last year, Fort Collins claims the top spot for motorcycle owners. The city scored well across all our metrics and its beautiful scenery was an added plus. Top 10 shakeup. This year’s study welcomed three newcomers to the top 10: San Diego, Colorado Springs and Reno. While all three cities made last year’s top 25, their improved numbers in 2017 bumped them up to the best of the best. Upstate New York bottoms out. Known for its long and snowy winters, it may be no surprise that upstate New York isn’t so motorcycle friendly. Buffalo ranked dead last and Rochester was a close second. So if you live in one of these cities, you might have to keep your hog hidden in the garage for most of the year. 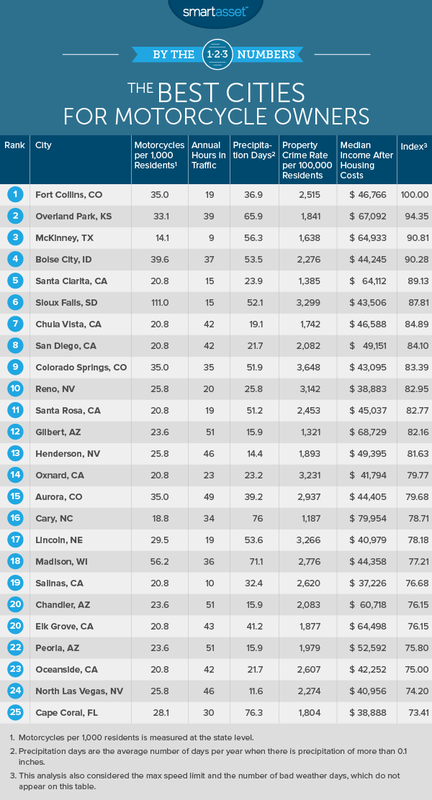 Fort Collins tops our list as the best city for motorcycle owners for the second year in a row. It’s no wonder why, when you consider its prime location along the Cache La Poudre River and the Rocky Mountains. Fort Collins only has about 36 days a year of rain, the fifth-best of the top 10. Its overall temperature isn’t so bad either, with only 60 days a year where maximum temperatures go below 40 or above 90 degrees, leaving you most of the year to live and ride comfortably. When it comes to safety, motorcycle owners will be happy to know that property crimes in Fort Collins have decreased from last year. Plus, the city has only 19.5 hours of traffic delay per year. Up from the number 5 spot last year, you wouldn’t want to underestimate Overland Park. The city stands out by having the 10th-highest discretionary income overall, meaning its residents have more income left over after housing costs. Overland Park also saw its property crime number decrease by about 100, ranking 16th-best overall. In terms of Overland Park weather, though, the city’s location may not give motorcyclists the best conditions. When compared to the rest of the top 10, Overland Park has the most precipitation days and the seventh-most days of bad temperatures. The only Texas city to crack our top 25, McKinney doesn’t disappoint. Residents will rejoice to know that McKinney has the least amount of traffic out of all the cities we looked at. And motorcyclists may be happy to learn that the state has the highest maximum speed limit at 85 mph. Interestingly for Texas, McKinney sees the second-most precipitation out of our top 10, after only to Sioux Falls. Summers in McKinney tend to be humid and hot, while the winter sees a lot of rain and the occasional snowstorm. Springtime also gets its fair share of rain, so you might want to check the forecasts before you head out on the open road. The capital of the Gem State, Boise’s location definitely lives up to its state’s nickname. You can hop on your hog and go on a ride along the Boise River, through the Treasure Valley, through the Boise Foothills and to a number of other beautiful natural destinations. Like in McKinney, though, you will have to make sure it’s not too hot, too cold or too rainy outside. Boise does have higher numbers in those weather aspects when compared to the rest of the top 10 cities, but overall the city performs rather well. While not specific to auto theft, the property crime number did see a slight increase, landing with the sixth-highest number in the top 10. Luckily, the discretionary income has gone up since last year, so you could have the necessary funds in case of auto theft. 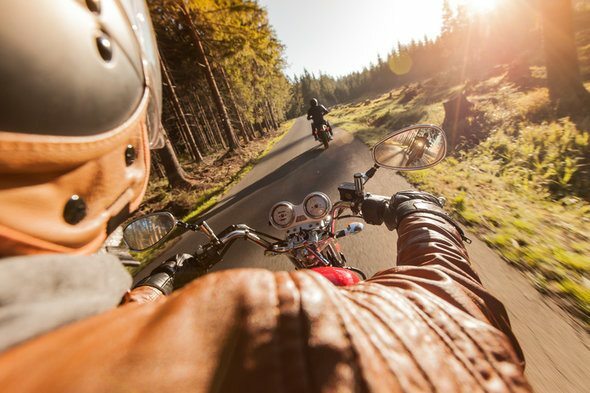 The state of Idaho also has the eighth-highest number of motorcycles per 1,000 people. This means that you shouldn’t have to search too hard to find buddies to ride with. For motorcyclists, Santa Clarita offers the sprawling Santa Clarita Valley and hills to explore, as well as the rest of Los Angeles County. Lots of beautiful space to ride isn’t the only good thing Santa Clarita has to offer, though. Its median income after housing costs increased from last year, landing in the 14th-best spot overall. The city also boasts the fourth-lowest number of property crimes out of the cities we looked at, and the best number in the top 10. Interestingly for Los Angeles, the city of Santa Clarita ranked seventh when it comes to fewest hours of traffic delay. You will want to avoid overheating, though, since the area comes with its fair share of heat. It averages about 105 days of bad temperature a year. Sioux Falls dropped four spots from last year. Its ranking was affected by a few metrics. For one, its discretionary income went down, dropping to the third-lowest in the top 10. The Best Little City in America also saw its property crime numbers spike by almost 300, making it the second-highest in the top 10. Sioux Falls did manage to snag the eighth-least amount of traffic overall, though. So you won’t have to worry about traffic delay. Plus, South Dakota has the highest number of motorcycles per 1,000 people, coming in at 110.99 motorcycles. This could be good for those who like to ride in a pack. Chula Vista promises a great place for motorcycle owners to live and ride. The city’s income after housing costs is lower than last year, ranking as the sixth-best in the top 10. It also saw a solid dip in property crimes, coming in as the 13th-best overall. Of course in Southern California, you won’t get anything but the best weather. The Lemon Capital of the World has the San Ysidro Mountains to the east and the San Diego Bay to the west. It only receives about 19 days of precipitation a year and only 2.8 days of bad temperature, ranking sixth in that metric. Luckily that means that when you do get stuck in some traffic (it is Southern California, after all), you won’t be stuck in a thunderstorm or stifling heat. San Diego, four spots higher on our list this year, lies just north of Chula Vista and offers even better weather. How is that possible? Well, San Diego clearly comes out on top when it comes to bad temperature days, as it has none. It sees about 21.7 days of rain a year, coming in second only to Chula Vista with the least amount of rain out of the top 10. Helping San Diego up to the number 7 spot was its property crime number dropping by about 300, landing as the 25th-best number overall. The city’s discretionary income also saw a slight drop, but still ranks in the overall top 30. Again, despite the traffic, San Diego provides a beautiful and comfortable place for motorcyclists to live. Colorado Springs boosted its way up into the top 10 this year largely due to its lower property crime numbers. The number of property crimes in the area dropped 10% from last year’s figure. The Springs performed pretty well across the board. It also helps that Colorado Springs offers motorcyclists the best views with the Rocky Mountains, the Palmer Divide and desert lands within reach. Being in the high desert, Colorado Springs does see some weather extremes like freezing nights in the winter and hot days in the summer. However, the city averages only 63.1 days of bad temperature and 51.9 days of precipitation per year – both decent numbers. Up from the 16th spot last year, Reno closes out this year’s top 10. Reno doesn’t stand out much in any metric, but still has some solid numbers. In terms of weather, Reno sits in the wetlands of the Rocky Mountains, meaning it does get its fair share of rain. Despite that and its average 61 days of temperature extremes, Reno and its residents get to bask under the Nevadan sun for most of the year. The Biggest Little City in the World, as it’s called, also has the second-highest max speed limit in the top 10 and ranks 18th overall in annual hours of delay per commuter. Discretionary income. This metric looks at the median income after housing costs are taken into account. This data comes from the U.S. Census Bureau’s 1 year estimates from the 2015 American Community Survey (ACS). Precipitation days. This number shows the average number of days per year where a city’s precipitation exceeds 0.1 inches. This data comes from the National Oceanic and Atmospheric Administration (NOAA). Bad temperature days. This number represents the number of days per year that a city sees temperatures lower than 40 degrees or higher than 90 degrees. This data also comes from NOAA. Traffic. This number reflects the annual hours of delay per commuter caused by traffic. This data comes from the Texas A&M Mobility Institute. Property crime. Property crime reflects the annual number of property crimes per 100,000 residents in each city. These crimes include, but are not limited to, auto theft. This data comes from the FBI Uniform Crime Reporting. Max speed limit. The max speed limit reflects the maximum speed in the state where each city is located. This data comes from the Governors Highway Safety Association. A high speed limit was considered a positive for the purposes of this study. Motorcycles per 1,000 residents. This metric looks at the number of motorcycle registrations per 1,000 residents in a state. We considered a high number of motorcycles per capita as a positive. This data comes from the Federal Highway Administration. Note that in last year’s study, we looked at the number of residents per 1,000 motorcycles per state. We ranked each city by each of the above metrics, giving half weight to precipitation and bad temperature days, and full weight to all the other metrics. Then we averaged those rankings. Finally we calculated an overall index based on the average rankings. The best city received a perfect index score of 100, while the lowest scoring city received a score of 0.